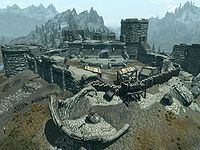 Fort Greymoor is a medium-sized fort west of the Western Watchtower near Whiterun. It is, at first, occupied by hostile bandits, but will be taken over by whoever wins the civil war, or it may be taken by the faction holding Whiterun if it is cleared of bandits. The fort has an exterior courtyard and two interior zones: Fort Greymoor and Fort Greymoor Prison. The fort is crumbling and part of the missing sections of wall have been replaced by log palisades. The main entrance to the courtyard is past two rows of barricades arranged in half circles around the arch forming the entrance from the southeast. To the left of the entrance when viewed from outside of the fort is a small cage hanging from a beam; it contains a dead bandit. You can loot this bandit either by standing under and jumping or by dropping from above. There are two bandits on guard on the wall over the entrance with three more spread around the walls and courtyard. There are practice dummies set up to imitate guards on the walls around the outer wall of the fort. 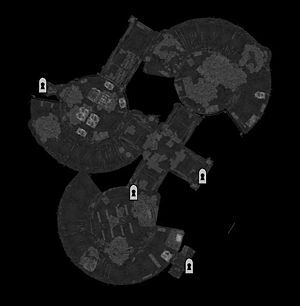 There are two stables near where the eastern tower used to stand and between the first of these and the wall is an unlocked chest. To the north of the stables is a wooden hut with a blacksmith's forge and workbench inside and a tanning rack on the side next to a wagon wheel. In front of the forge is a log table with a pile of firewood underneath. Opposite the arched entrance is a short flight of stairs up to a raised area with a set of wooden double doors leading to the interior of the fort. There is a fire to the left and a couple of barrels in the corner further to the left. To the right is a boarded over well. To the left of the northern tower is a double flight of wooden stairs up to another wall connecting this tower with another to the west. There is a doorway leading inside where there is a fire with a bottle of Nord mead and a bottle of Black-Briar mead next to it and a crate with two loose coins on top. 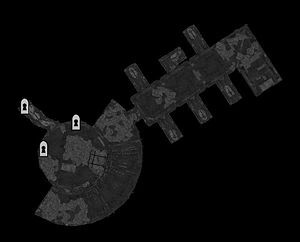 There are barrels, crates and a sack in this area as well as an unlocked chest to the right of the second doorway. The second doorway leads to the top of the main part of the fort. On your right is a flight of stairs up to the top of another tower. A bandit is on guard here and a small round table and chair. On the table is a flute, bottle of Black-Briar mead and a couple of coins that may have fallen to the floor. A dummy is holding a long bow and quiver of iron arrows that can taken. Continuing along the top of the main part of the fort, there is a trapdoor entrance behind some rubble by a large wooden structure leading up to a lookout platform. There is a second flight of stairs back down to a barrel containing ingredients with a random poison, an iron dagger and small coin purse laying on the ground. Heading southeast along the wall, there are stairs down and up, past another dummy guard to the tower in the southern corner of the fort. There is another trapdoor here that leads into the prison. This completes the circuit of the outer wall of the fort. Entering through the main double doors will bring you straight to a crossroads with rooms to the southwest, northwest and northeast. To the southwest is a dining room with four long wooden tables holding three bottles of Nord mead, three seared slaughtfish steaks, a baked potato, a portion of grilled leeks and a goat cheese wedge. There is a large fire place to the north of the room with a copy of Argonian Account, Book 1 on the floor and an iron helmet and sword on the mantle over the fire. To the southeast is a short corridor leading to an unlocked wooden door to the Prison, there is an oil slick on the floor here. To the left of the door are some small cages and a couple of barrels are to the right. To the south of the dining room is an opening to a wide spiraling stairway leading up to the right. On your left is an iron warhammer on the floor. Climbing the stairs you passed an iron helmet on the stairs. At the top there is a circular room above the dining room. There is a bandit wandering around here and three practice dummies set up around the room. To the northeast is a ladder to a trapdoor in the ceiling and directly opposite against the wall is an unlocked boss chest. To the southeast is an open door leading to a bedroom with a dead corpse of an Imperial soldier, between the door and ladder is a lecturn holding a copy of the Light Armor skill book Rislav The Righteous. Inside the bedroom is an empty sideboard and table, an unowned double bed with a bookcase containing a red apple, a random pair of boots and copies of Darkest Darkness, Brief History of the Empire, v2, The Wolf Queen, v3, A Dance in Fire, v4, The Song of Pelinal, v2 and The Hope of the Redoran. The short corridor to the northwest from the main entrance has twelves weapon racks, six each side holding two iron swords and two Imperial swords. This leads to a room dominated by a large cage containing two burnt corpses, there is a magic using bandit looking at a skeleton on a table to your left as you enter. Under the table is a novice-locked chest. Behind the cage is a pair of leather boots and on a table against the wall to the northwest is a random potion of healing, a random potion of stamina, a random regeneration potion, a small coin purse, four loose coins and a lockpick. Through a doorway to the west is what appears to be their latrines with three stalls with loose stone walls between each. On one of these walls is an Imperial light helmet. There is a wide flight of stairs spiraling down opposite. At the bottom through a doorway is a tripwire that activates a swinging mace trap. In the room behind is a dead skeever and a short corridor heading to the northwest, it leads to a corridor being used as a storage area with two more dead skeevers and three bear traps scattered on the ground. On your left are two sets of shelves containing seven sacks, a pair of leather boots and a potion of the defender, a potion of the warrior and a potion of strength, two more sacks are between the two sets of shelves. Straight ahead is a partially flooded corridor leading to a sewer pipe and exit that leads outside to the northwest of the fort. On your right is a platform with barrels and an adept-locked chest located underneath. There are four more sets of shelves on top of the platform containing a bottle of wine, two wolf pelts, three sacks, a small coin purse, two woodcutter's axes, ten bottles of Nord mead, a pair of leather boots and a lockpick. There are four more bottles of Nord mead on the ground beside them. To the left of the platform is a doorway to wide spiraling stairs leading up and to the left of this is a firewood pile with a woodcutter's axe on a wooden block. There is a bandit patrolling these stairs and a steel warhammer found partway up. At the top are several straw bales and a doorway into the kitchen area. The corridor to the northeast of the main entrance leads to the same kitchen area, there is a bandit guard and Agnis if you are here for the relevant quest. On your left as you enter this room is a large fire place with a spit hanging in front of it with three potatoes in a pot on the spit. To the right is a door to storage room with three sets of shelves containing a random illusion potion, a random healer potion and a random enhanced stamina potion and a potion of minor healing. In the center of the kitchen are two long wooden tables laid end to end with a whole salmon, an iron dagger and four pieces of bread. To the southeast is a door leading to a bedroom with a single bed, a dresser with a copy of A Dance in Fire, v1 and a sweet roll on a wooden plate on top. To the right is a table with a practice dummy and iron dagger on. Against the southeast wall is a bookcase containing a random strength potion and copies of Brief History of the Empire, v1, Beggar Prince, The Song of Pelinal, v6, The Monomyth and The Wolf Queen, v3. Note: If you have joined the Imperial Legion, completed the quest to hold Whiterun and previously cleared this fort of bandits, the Imperial soldiers will not be hostile toward you. You enter into a circular room with a bear trap right by the door. There are several small cages and one larger apprentice-locked cage. Inside the cage is a dead hunter and a charred skeever hide on a wooden plate. There is a long wooden table in the center of the room with a bottle of wine, an iron dagger and a rock warbler egg in a wooden bowl on the table. To the northwest is a door to Fort Greymoor with a pair of random boots beside it. On the west side of the room is a ladder to the trapdoor in the ceiling that leads to the top of the tower. At the rear of the room is an opening leading to a wide spiraling stone stairway with a bandit patrolling up and down. To the right of the opening is a small round wooden table with a medium coin purse, two loose coins and an iron dagger on top. You can hear a bandit talking to themselves at the bottom of the stairs. Through a doorway there is a set of shelves full of worthless clothing and a doorway to the northeast to the cells. There are six cells all containing bed rolls, three on each side of a central corridor. On the left the first is unlocked with a dead hunter inside, the second and third are empty, On the right the first is empty, the second is novice-locked and has a dead high elf inside, the third is master-locked, but contains nothing. At the end of the corridor it turns to the east and there is a bandit inspecting a dead troll on a table with their back to you. Be careful to avoid the bone chimes hanging from the ceiling. On the table with the troll is an iron dagger, two lockpicks and a salt pile. Under the table is bear trap and to the left an unlocked chest. In the northern corner are two small empty cages hanging from the ceiling. In the middle of the northeast wall at head height is a level-locked chest on the wall containing a potion of health and leveled poison. If you clear this location of bandits, but have not completed the Battle for Whiterun, only the external bandits will respawn. The interior will respawn, but not the bandits. Sometimes after fully clearing out the fort, the unnamed bandits will still respawn instead of Imperial soldiers. This page was last modified on 31 March 2019, at 00:18.